Emerging semiconductor laser technologies are revolutionizing the industrial material processing and optical sensing markets. Automotive and electronics industries are benefiting greatly from advances in laser manufacturing, 3D sensing and imaging, lidar, and industrial machine vision. 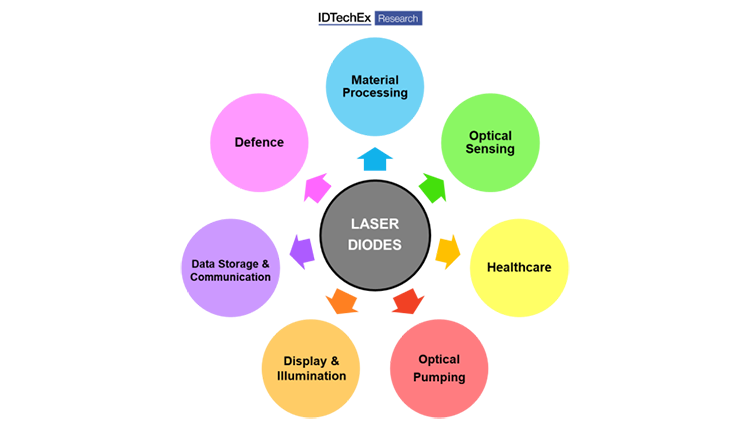 These innovations are discussed in detail in the recently released report from IDTechEx Research, ‘Laser Diodes & Direct Diode Lasers 2019-2029: Technologies, Markets & Forecasts’. Laser diodes are compact and energy efficient semiconductor technologies, which are available at unit prices below $1 for mass produced devices. Products are offered in many wavelengths from ultraviolet to long-wave infrared: the wavelength is determined by the device structure and its semiconductor materials. Laser diodes are very different to light-emitting diodes (LEDs). Unlike LEDs, laser diodes produce a coherent beam of monochromatic light (one wavelength), which remains collimated at long distance as observed with common laser pointers. Laser diodes also have a higher radiance (brighter) and are more energy efficient compared to LEDs. The physical mechanisms underpinning these differences is the generation of laser light via a process known as stimulated emission, and the amplification of light using an optical cavity between two mirror surfaces. In contrast, LEDs generate light via spontaneous emission and contain no optical cavity. During the past three decades, the average power of laser diodes has increased exponentially, while their average price has decreased exponentially. These incredible advances in semiconductor laser technology enable the development of direct diode lasers (DDLs), including high-power direct diode lasers (HPDDLs) that produce multi-kilowatt output power. Dramatic improvements in laser beam quality now enable users to focus the light to a small point, and this revealed DDLs as rapidly evolving tools for metal, plastic and composite processing. Consequently, DDLs and HPDDLs are emerging as major global trends in industrial manufacturing, with Panasonic (Japan) acquiring the HPDDL manufacturer TeraDiode (USA) to enhance their position in the laser material processing market. A particularly important trend is the development of blue diode lasers for applications like welding and 3D printing copper, with key player Laserline (Germany) launching a 1 kW product in 2019. Blue laser light is faster and more efficient at processing metals like copper that are poor absorbers of conventional infrared radiation. Today’s DDL key players are demonstrating novel applications of diode lasers that were dismissed as impossible by critics a decade ago, while partnering with automotive manufacturers like Volkswagen (Germany) to optimize laser processing parameters. The wide adoption of laser diodes in optical sensing markets is also transforming the automotive and electronics industries. Semiconductor lasers for sensing are manufactured by multinational giants like Sony (Japan), laser industry key players like II-VI Incorporated (USA), and smaller companies like CNI (China) who have expertise in machine vision. The figure below shows some examples of industries that benefit from laser diode technologies for 3D sensing and imaging. A key trend in 2019 is the rise of vertical-cavity surface-emitting laser (VCSEL) technology for applications like facial recognition in smartphones. VCSELs are a type of laser diode that offers superior beam properties, thermal stability and device scalability compared to products like Fabry Perot laser diodes. Companies like II-VI (2-6) are investing into quickly growing their VCSEL production capacity and enhancing their position in the VCSEL market. In November 2018, II-VI announced plans to acquire VCSEL expert Finisar (USA). Another rapidly evolving laser technology is lidar, originally an acronym of Light Detection And Ranging (LiDAR). In 2018, BMW i Ventures, the BMW venture capital fund, invested in the lidar start-up Blackmore (USA). Blackmore’s innovative lidar sensors for self-driving cars use a frequency-modulated continuous wave (FMCW) light source and scan laser beams using solid-state methods, which is different to traditional lidar systems that use pulsed light and mechanical scanning. FMCW lidar combines optical communication hardware and radar signal processing methods to deliver accurate information on both object distance and velocity. The adoption of automotive lidar and in-cabin monitoring technologies by the autonomous vehicle industry are important trends that support growth in the laser diodes market. The global market for laser diodes and direct diode lasers will reach a size of $13.985bn by 2029, where laser diodes account for $11.952bn and direct diode lasers account for $2.033bn. Remarkably, the optical sensing market segment grows by an order of magnitude during the 2019-2029 period. 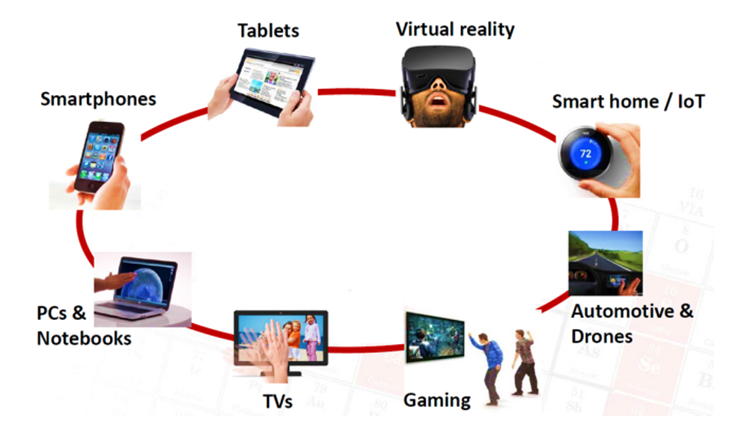 The preview below is from a forecast by analysts at IDTechEx, a market research and technology consulting firm based in Cambridge (UK) with subsidiaries in Germany, Japan and USA. 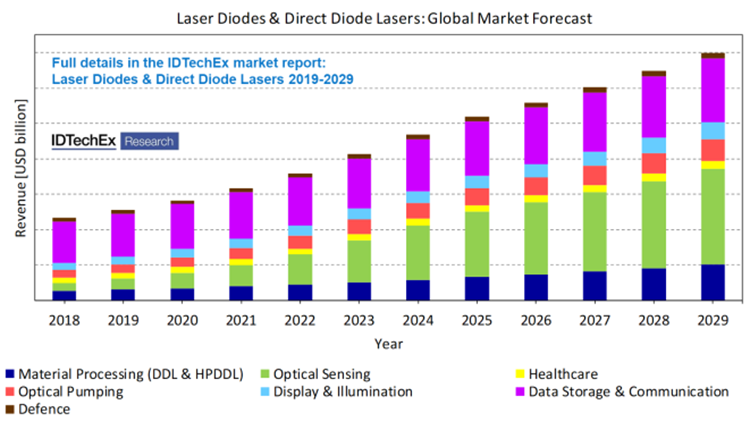 In the recent report titled ‘Laser Diodes & Direct Diode Lasers 2019-2029: Technologies, Markets & Forecasts’, IDTechEx analyst Dr Nilushi Wijeyasinghe explores how advances in laser diode technologies affect the growth of market segments outlined above. The report’s strong focus on material processing, optical sensing and optical pumping reveals how semiconductor laser technologies are diverse tools that underpin innovation and business growth in various industries. Recent progress is highlighted using case studies, where she draws on her background in laser physics and semiconductor physics research to explain new technical concepts. The report evaluates the advantages and challenges associated with laser technology adoption to provide a balanced outlook on market opportunities. Market forecasts are based on the extensive analysis of primary and secondary data, combined with careful consideration of market drivers, restraints and key player activities. Dr Nilushi Wijeyasinghe will discuss some of these topics at a Trends in Photonics technology masterclass on 12th April 2019, hosted at the IDTechEx Show! Europe in the Estrel Convention Center, Berlin (Germany).